Continuity mistake: When Pierce first begins to interrogate Caliban in the safe house in Mexico, a large portion of Caliban's albino makeup is smudged below his nose, revealing the actor's natural skin in his first close-up of the scene; after switching to a close-up of Pierce, then back to Caliban, the smudge has been fixed. 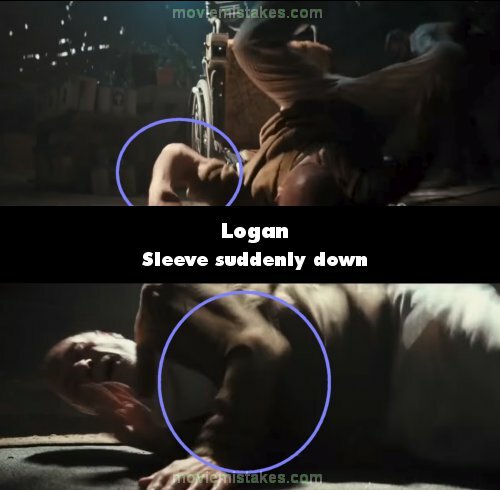 Continuity mistake: When Logan shoots Dr Rice at the start of the final fight, the shot changes to Logan and shows him firing a gun using his right hand. The shot changes to Pierce being shot, then to a wide shot showing all three men. 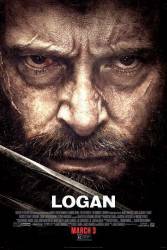 The gun is now suddenly in Logan's left hand. Factual error: Logan and Laura emerge from an urgent-care clinic in a small town, presumably somewhere in the Great Plains or eastern Rockies. Shortly after they emerge from this clinic, a Louisiana state highway sign is visible in the background. As the scene ends, the camera pulls back to show mountains in the background, indicating that they aren't in Louisiana. Continuity mistake: When Pierce is in the limousine, he pulls out a business card, and holds it out to Logan, who doesn't take it. In one shot, Pierce holds it with the writing facing himself, but in the next shot, it's upside down with the writing facing Logan, and you look closely, it only has print on one side. Continuity mistake: After Logan leaves the clinic and is walking with Laura on the street, just before they get in the truck the sun changes between shots. Continuity mistake: After Pierce hooks Laura in the chest, she got some blood on the blouse and a hole, later in the convenience store she has the blood on it but the hole is gone.